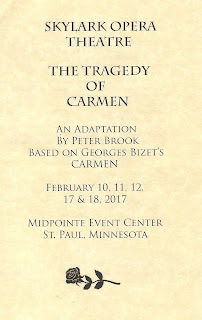 I'd never seen Carmen, or listened to any cast recording, but still much of the music was familiar to me (I'm chalking it up to my obsession with figure skating in the '80s and '90s). However I wasn't familiar with the story (which is basically: boy meets girl, girl rejects boy, boy turns homicidal), and in this 90-minute adaptation I wasn't entirely clear on exactly who everyone was or why they were acting the way they were. But what is crystal clear in this production is the grand emotions felt by the characters, beautifully expressed through the music, and perfectly portrayed by the cast. The Sterling Hall in the Midpointe Event Center (just off University and 94) is set up with corridor stage seating - the stage is a narrow walkway with just a few rows of seats on either side, no set other than a few benches. In a small space like that there is no need for amplification, and the cast is happily not miked. It's such a treat to hear these gorgeous classically trained voices in an intimate setting, without amplification to get in between those voices and your ears. The familiar music sounds beautiful under music director Barbara Brooks on piano, with Matt Williams on viola (who gets a few moments in the spotlight - yay band!) and Will Richardson on cello. And what voices there are in this cast! Tess Altiveros is strong as Carmen, conveying all her many moods through her beautiful and expressive voice. She's well-matched in Laurent Kuehnl as Don Jose. But rather than this dysfunctional couple, I found myself rooting for Jennifer Baldwin Peden's Micaela (because when don't I root for a Baldwin?) and John Allen Nelson, who imbues toreador Escamillo with a Nathan Fillion-esque charm. Rounding out the cast are Jennifer Eckes, walking with a swagger I've never seen before, and Kevin Klein as a couple of unlikable men. The intimate space allows the cast to get a little playful with the audience, which is always fun. Samantha Fromm Haddow's costumes set this Carmen squarely in the present, with the title character dressed in black leather and the soldiers in US Army fatigues. But there's also a moment for a showy costume in Escamillo's full-on blinged out bright red toreador costume. Matt McNabb's lighting sets the mood, including some cool shadow effects, and characters bathed in red light as things take a violent turn. 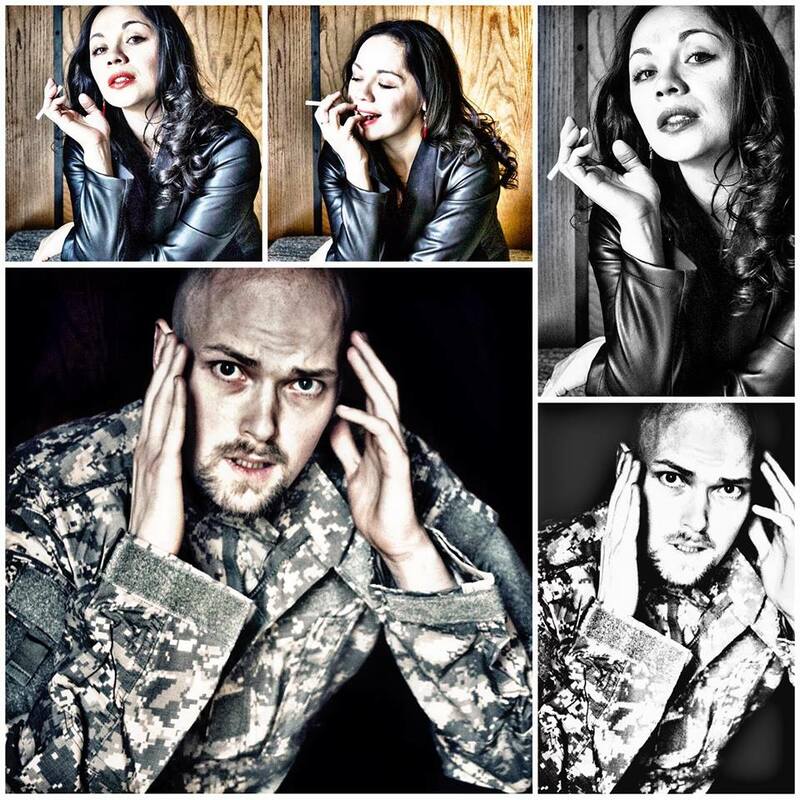 If you're an opera aficionado, you might be curious to see this modern take on a classic. 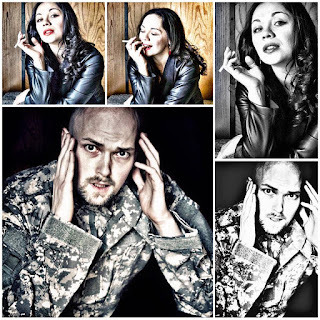 For opera neophytes, Skylark Opera once again provides an accessible, easily digestible, and affordable take on the genre. 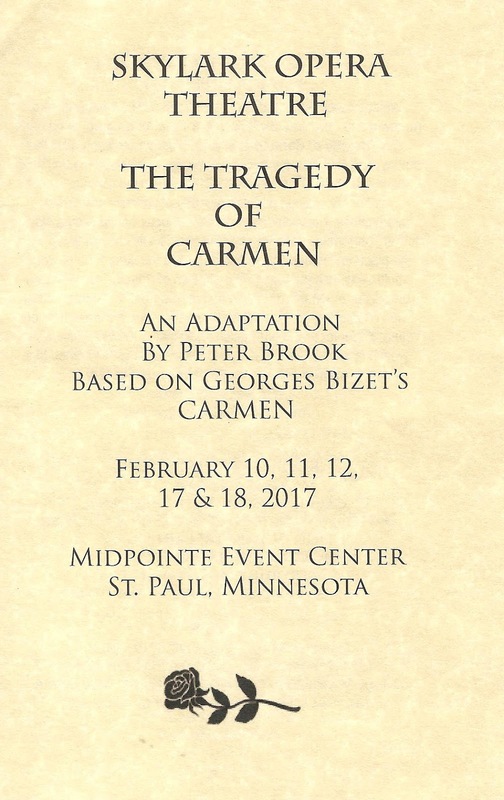 The Tragedy of Carmen continues through February 18 only.